Though the Atlantic Yards project was significantly stalled during 2008, developer Forest City Ratner spent $928,652 on city and state lobbying. At least 80% of the spending involved Atlantic Yards. The total represents only a 20% decline from the 2007 total of $1,160,186. That total ranked the developer eighth in the state and second (to Columbia University) among real estate projects, according to a 4/9/08 report from the New York State Commission on Public Integrity. The 2008 rankings have not yet been released, but Forest City Ratner likely will be near or in the top ten. Arena site valuation at issue? While the subjects of the lobby effort are described in broad terms (e.g., "budget regulatory and legislative issues"), they also offer some tantalizing hints. Forest City Ratner is apparently trying to ensure it receives credits for brownfield cleanup. It is in talks with the city and Metropolitan Transportation Authority--remember, the New York Observer reported that FCR is trying to delay paying the MTA the $100 million in cash pledged, and has sought a speedier delivery of the city's pledged $100 million. And, perhaps most importantly regarding the issuance of bonds for the planned Brooklyn arena, Forest City Ratner is lobbying the New York City Department of Finance (DOF). Remember, the arena site would be tax-exempt, but PILOTs (payments in lieu of taxes) would be used to repay the arena bonds. However, the PILOTs cannot be larger than the foregone taxes, and the arena site valuation must be high enough to ensure that the foregone taxes are significant. In order to value the Yankee Stadium site, the DOF looked well beyond the South Bronx for comps (comparable properties), even to a vacant lot in Alphabet City, more than seven miles away. In 2007, Forest City Ratner had the second largest lobbying contract. with the law firm Fried Frank Harris Shriver & Jacobson, valued at $771,170. According to 2008 lobby data from the commission, the developer last year paid Fried Frank $364,874. In 2006, the year during which the City Planning Commission considered AY for an advisory vote, the three affected Community Boards weighed in, and the Empire State Development Corporation and Public Authorities Control Board approved the project, Forest City Ratner spent $2,105,141 on lobbying. According to 2008 data, Forest City Ratner's Atlantic Yards Development Group spent $746,201. Forest City Ratner spent $105,035 on lobbying firms and $17,416 on in-house lobbyists, on a variety of projects. The Forest City Residential group spent $60,000 on lobbyists regarding projects in Westchester. NYC Metro area: Geto & DeMilly; Locicero & Tan; Richard Lipsky Associates; and The Carey Group. Albany: Meyer, Suozzi, English & Klein; Patricia Lynch Associates (run by a former top aide to Assembly Speaker Sheldon Silver); and Wilson, Elser, Moskowitz, Edelman & Dicker. Where is Senator Pothole D'Amato hidden in this Lobbyist List? How much has he been paid to make The One $500,000 Super Macher Phone Call this time? D'Amato has been lobbying the federal government. The database referred to in this article covers only city and state lobbying. BUT -- the Fed-Stim buck$ are being funneled through NY State. Seems to me, therefore, that Sen. Pothole is going after the Fed Funds by lobbying the State. So, for doing this special kind of omni-lobbying, shouldn't he have to list with State lobbyists, too. 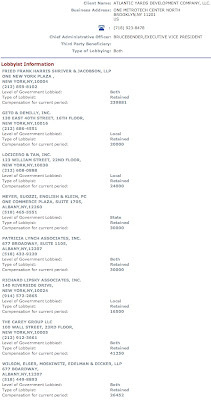 D'Amato's firm, Park Strategies, is listed in the database, but neither Forest City Ratner nor the Atlantic Yards Development Group is listed as a client. Fried Frank, interestingly, worked for the Yankees during their stadium push as well. I don't have records handy of whether it was on the land valuation issue. "Obama said all requests to lobby his administration will be posted on the Internet along with written explanations for how the lobbyists propose spending the money. Details of meetings between administration officials and all lobbyists will be recorded and made public."